Dyeing is the process of adding color to textile products like fibers, yarns, and fabrics. Dyeing is normally done in a special solution containing dyes and particular chemical material. After dyeing, dye molecules have uncut Chemical bond with fiber molecules. The temperature and time controlling are two key factors in dyeing. There are mainly two classes of dye, natural and man-made. For most of the thousands of years in which dyeing has been used by humans to decorate clothing, or fabrics for other uses, the primary source of dye has been nature, with the dyes being extracted from animals or plants. In the last 150 years, humans have produced artificial dyes to achieve a broader range of colors, and to render the dyes more stable to resist washing and general use. Different classes of dyes are used for different types of fiber and at different stages of the textile production process, from loose fibers through yarn and cloth to completed garments. Acrylic fibers are dyed with basic dyes, Nylon and protein fibers such as wool and silk are dyed with acid dyes, polyester yarn is dyed with disperse dyes. Cotton is dyed with a range of dye types, including vat dyes, and modern synthetic reactive and direct dyes. There are many forms of yarn dyeing. Common forms are the at package form and the at hanks form. Cotton yarns are mostly dyed at package form, and acrylic or wool yarn are dyed at hank form. In the continuous filament industry, polyester or polyamide yarns are always dyed at package form, while viscose rayon yarns are partly dyed at hank form because of technology. These softened packages are loaded on a dyeing carrier’s spindle one on another. After dyeing, the packages are unloaded from the carrier into a trolly. Now the trolly is taken to hydro extractor where water is removed. Both dyes and pigments appear to be colored because they absorb some wavelengths of light more than others. In contrast with a dye, a pigment generally is insoluble, and has no affinity for the substrate. Some dyes can be precipitated with an inert salt to produce a lake pigment, and based on the salt used they could be aluminum lake, calcium lake or barium lake pigments. Dyed flax fibers have been found in the Republic of Georgia dated back in a prehistoric cave to 36,000 BP. Archaeological evidence shows that, particularly in India and Phoenicia, dyeing has been widely carried out for over 5000 years. The dyes were obtained from animal, vegetable or mineral origin, with no or very little processing. By far the greatest source of dyes has been from the plant kingdom, notably roots, berries, bark, leaves and wood, but only a few have ever been used on a commercial scale. Vat dyes are essentially insoluble in water and incapable of dyeing fibres directly. However, reduction in alkaline liquor produces the water soluble alkali metal salt of the dye, which, in this leuco form, has an affinity for the textile fibre. Subsequent oxidation reforms the original insoluble dye. The color of denim is due to indigo, the original vat dye. Reactive dyes utilize a chromophore attached to a substituent that is capable of directly reacting with the fibre substrate. The covalent bonds that attach reactive dye to natural fibers make them among the most permanent of dyes. “Cold” reactive dyes, such as Procion MX, Cibacron F, and Drimarene K, are very easy to use because the dye can be applied at room temperature. Reactive dyes are by far the best choice for dyeing cotton and other cellulose fibers at home or in the art studio. Disperse dyes were originally developed for the dyeing of cellulose acetate, and are water insoluble. The dyes are finely ground in the presence of a dispersing agent and sold as a paste, or spray-dried and sold as a powder. Their main use is to dye polyester but they can also be used to dye nylon, cellulose triacetate, and acrylic fibres. In some cases, a dyeing temperature of 130 °C is required, and a pressurised dyebath is used. The very fine particle size gives a large surface area that aids dissolution to allow uptake by the fibre. The dyeing rate can be significantly influenced by the choice of dispersing agent used during the grinding. Azoic dyeing is a technique in which an insoluble azo dye is produced directly onto or within the fibre. This is achieved by treating a fibre with both diazoic and coupling components. With suitable adjustment of dyebath conditions the two components react to produce the required insoluble azo dye. This technique of dyeing is unique, in that the final color is controlled by the choice of the diazoic and coupling components. This method of dyeing cotton is declining in importance due to the toxic nature of the chemicals used. Sulfur dyes are two part “developed” dyes used to dye cotton with dark colors. The initial bath imparts a yellow or pale chartreuse color, This is aftertreated with a sulfur compound in place to produce the dark black we are familiar with in socks for instance. Sulfur Black 1 is the largest selling dye by volume. One other class that describes the role of dyes, rather than their mode of use, is the food dye. Because food dyes are classed as food additives, they are manufactured to a higher standard than some industrial dyes. Food dyes can be direct, mordant and vat dyes, and their use is strictly controlled by legislation. Many are azo dyes, although anthraquinone and triphenylmethane compounds are used for colors such as green and blue. Some naturally-occurring dyes are also used. Laser dyes: see, for example, rhodamine 6G and coumarin dyes. The process “vat dyeing” refers to dyeing in a bucket or vat. It can be performed whenever a liquid, even shade over the entire garment is desired. Almost any dye can be used, including fiber reactive dyes, direct dyes, and acid dyes. One alternative to vat dyeing is direct dye application, such as the process used for tie dyeing. “Vat dyes” are a special class of dyes that work with a special chemistry. Cotton, wool, and other fibers can be all dyed with vat dyes. Note that not all vat dyeing is done with vat dyes. Most vat dyes are less suitable than fiber reactive dyes for the home dyers, as they are difficult to work with; they require a reducing agent to solubilize them. The dye is soluble only in its reduced (oxygen-free) form. The fiber is immersed repeatedly in this oxygen-free dyebath, then exposed to the air, whereupon the water-soluble reduced form changes color as oxygen turns it to the water-insoluble form. Indigo is an example of this dye class; it changes from yellow, in the dyebath, to green and then blue as the air hits it. Inkodye is a type of vat dye which uses light rather than oxygen to ‘fix’ the dye, with a wide variety of possible effects. These dyes, which are chemically similar to vat dyes, are developed by light instead of being applied in an oxygen-free bath and being developed in the fabric by exposure to oxygen. Inkodyes are true dyes, not fabric paints. A dye itself attaches to the fabric; fabric paint includes a glue-like binder, which imparts a stiffer feeling to the fabric. The process is more difficult than the process of tie-dyeing with fiber reactive dyes. PRO Chemical & Dye, which sells some vat dyes, provides instructions online for Immersion Dyeing using PRO Vat Dyes. The process requires the use of lye (sodium hydroxide), which must be used with due care, including the use of safety goggles. Indigo is subject to major crocking (rubbing the dye off onto other items) unless it is applied carefully. This means use a weaker dyebath, and dipping many times, rather than a single strong dipping. Application of vat dyestuff is not so easy like direct or reactive dyes. The application involves a lot of chemistry – such as oxidation, reduction, pH control and so on. Even the dissolution of the dyestuff involves a great technique of reduction using adequate quantities of caustic soda and sodium hydrosulphite. There are several methods available for the application of vat dyes to yarn and fabric. The Vat dyes are having all around fastness properties which cannot be possible in any class of dyes .the only problem in this class is slightly poor rubbing fastness.which can be increased by special after treatment. Indigo is a vat dye that has been used around the world for many centuries. Rit Color Remover contains sodium dithionite (sodium hydrosulfite) and sodium carbonate, and can be used to reduce vat dyes in order to apply them. By : AVM Chemical Industries. The name Vat was drived from the large wooden vessel from which vat dyes were first applied. Vat dyes provide textile material with the best color fastness of all the dyes in common use. Vat dyes are an ancient class of dye, based on the original natural dye, indigo, which is now produced synthetically, and its close chemical relative, historic tyrain purple. Cotton and wool, as well as other fibers, can be dyes with vat dyes. Vat dyeing means dyeing in a bucket or vat.it can be done whenever a solid even shade, the same color over the entire garments, is wanted, using almost any dye, including fiber reactive dye, direct dye, acid dye etc. the opposite of vat dyeing is direct dye application, such as, for example. Tie dyeing “vat dyes” are a special class of dyes that work with a special chemistry. Vat dyes are difficult chemicals to make and their structures are complex some of these. Will be shown the sub heading vat dyes. The different chemical structures affect the Solubility of the sodium leuco vat, its stability towards over reduction and over oxidation, its Substantively its rate of diffusion into and out of the fibers and the ultimate properties of Dyeing. Solubilised vat dyes are absorbed into cellulosic fiber, wool, silk and nylon from aqueous solutions often containing small amount od sodium Nitrate, followed by hydrolysis in a acidic bath and by oxidation with oxidizing agent as shown in reaction. Solubilised vat dyes are very low in affinity for cellulosic fiber as compared with the corresponding leuco salts of vat dyes, so the adding large amount of natural salts to the dyebath. Most vat dyes are sold in insoluble oxidized form. The first operation therefore, consists of reducing to the lecuo compound and dissolving the latter in alkali, a process commonly referred to as vetting. The classical nature vat dyes such as Indigo and Tyrian purple were reduced in fermentation vat. One of the earlier processes for reducing Indigo, based on the use of chemicals instead of micro – organisms, was with coppear’s as the colloquial name for ferrous sulphate; the ferrous sulphate was then predicated which rapidly reacted with the oxygen with the formation of ferric hydroxide, accompanied by the liberation of hydrogen. Since the Indigo leuco compounds dissolve in mild alkali the exces of calcium hydroxide sufficed for this purpose. the coppear’s method was followed by the Zinc line vat. Based upon the fact that zinc dissolved in lime water formation calcium zincate and hydrogen. Nither method was entirely satisfactory because the coppear’s precipitates of either ferric hydroxide or calcium zincates interfered seriously with the dyeing process. indigo blue deposited on the surface of the fibers. Vat dyes are as a class, the most light fast of all dyes.However, not all individual vat dyes are equally resistant to light.The following are lightfastness rating for the unmixed dyes. A light fastness of 7 is excellent, but a light fastness rating 5 is no better than you’ll find in many other dye classes. The wash fastness rating of vat dyes is about 4 – 5 .The excellent wash fastness of textile material, colored with vat dyes is attributed to the large vat dyes molecule as well as its aqueous insolubility. The large vat dye molecule is trapped within the polymer system of the fiber because of its size and aqueous insolubility and it is absorbed within the fiber system by vandarwals forces. 2. Jung Jin Lee, Woa Sub Shim, Ik sookim and Jae Pil Kim “ Dyeing and Fastness properties of Vat Dye on a Noval Regenerated Cellulosic Fiber ’’ Fibers and polymers 2005, Vol.6 No.3, 244 – 249 . 3. Giles,C.H.A laboratory course in Dyeing, society of Dyers and colorists publication 1957. 6. Sung – Hoon Kim, Young – A Son, Jin – Suk Bae, Dye chemistry Green Book company inc.2005. Pre-pigmentation: Because the chemicals necessary for for Vatting make the leuco-vat anions in solution highly substantative, there is always the possibility of unevenness, if circulation of the dye liquor is inadequate. But what if dispersions of vat pigments, with no substantivity, were t be circulated and uniformly distributed at the fiber surfaces before alkali and reducing agents were added? Once the pigments were deposited, Vatting will result in anion formation just where it is needed, at the fiber surfaces. it would certainly require very fine dispersions, with low particle size distributions, but this problem had already been overcome, and vat pigments are indeed available in such finely subdivided forms. Pre-pigmentation (before reduction) is a particularly useful alternative for light and medium shades where levelness might be a problem. Circulation of a pigment can begin at any time and at any temperature between ambient plant temperature and approximately 80C after about 20 minutes the chemicals are added to reduce the dye. Dyeing can then be completed with whatever temperature, time and salt conditions to achieve the best results. Semi-pigmentation: This is the name give to a process which is a hybrid of the leuco-vat and pre-pigmentation process. All the chemicals and dyes required for leuco-vat process are added and circulated through the good s at plant temperature for 20 minutes before raising the temperature to 60 – 80C for 30 to 40 minutes. The pigmentary dispersion is low to reduce at plant temperatures and is simultaneously but gradually deposited while it is reduced as the temperature is raised. Variations on this theme include the programmed metering of the Vatting chemicals in to the dye bath, to have total control of the rate of formation of the leuco-vat anion and consequently of leveling. Batch After Treatments: Regardless of the vat dyeing process used, once the dye bath has been dropped, the after treatments include the following steps: rinsing, oxidation, soaping and neutralization. Softening may be included is not fundamental. Rinsing: This can be eliminated if the oxidation is good, as it might be for pale shades; but with medium shades it is important to rinse out most of the alkali, reducing agents and loose dye; with heavy shades it might be necessary to include 1 to 2 grams per liter of Caustic soda and hydrosulfite and a little dispersing agent, in a reductive rinse, for about 5 minutes at room temperature. Oxidation: Usually this is carried out at approximately 60C for about 15 minutes with hydrogen peroxide and acetic acid, or sodium meta nitrobenzene sulfonate, or sometime, perborates. Soaping: This is usually carried out at 95C for about 10 minutes, followed by rinsing. It may be necessary with packages to split soaping in to two steps, the first being really a dispersing process conducted at about 60C to ensure that not loose color is available to aggregate and filter out at the second step, which is conducted at normal soaping temperature. Neutralization/ Rinsing: Depending on whether the oxidation was acidic or neutral, the soaped goods could be neutral or acetic acid rinsed, to ensure that tightly held alkali is not left in the fibers. Continuous dyeing process: The main economic advantage of continuous dyeing are to be derived from the rapid production of goods with very consistent shade. Speeds of 160 meters per minute are possible. But, the potential benefits have been increasingly curtailed by the shrinking size of individual dye lots, despite successful efforts by machinery manufacturers to make changing colors as painless as possible. When the threaded up length of a normal continuous dye range may be 400 meters, or even more, and the length of a particular dye lot may be only 1800 meters, this spells potential shade consistency problems for the continuous dyer. A conventional, fully continuous dye range suitable for dyeing polyester/ cotton , cotton and other blended fabrics in open width consists of 11 separate pieces of dyeing equipment strung together in line. Ideally, goods can be taken up between these pieces, and any piece may be bypassed. The pieces, in order, are: padder, pre-dryer, dryer, thermosol oven, padder, steamer, washer units and dryer. Only polyester/Cotton blends require thermosol oven treatment in which disperse dyes are fixed on to polyester fibers at 200-215C. The thermosol process will be discussed later on. The principle dye range configurations used for cellulosic fiber dyeing are called pad-steam or pad-dry-steam and wet-on-wet or pad-pad-steam process. Pad-Steam Process: The Pad-Steam process for continuously dyeing vat dyes is suitable for most flat cellulosic fabrics. Here a vat pigment dispersion is padded on to the goods and dried. A wet pick up of 60 to 70% might be suitable for many cotton and polyester/cotton flat goods. This process would be unsatisfactory for corduroy and terry cloth because the pigment will migrate to the fabric surfaces during drying. In addition to the issue of migration is the adverse surface effect ( flattening, distortion), if goods are not run wet-on-wet, avoiding pre-drying and drying cans. The goods are then padded with alkali and reducing agent, enter the steamer, where Vatting and leuco-vat anion diffusion take place, and are then successfully rinsed, oxidized, soaped and rinsed through the four sections of washing units, followed by drying. Dyes are generally defined along the lines of being coloured, aromatic compounds that can ionise. They are thus able to interact with oppositely charged tissue constituents. Dyes which are positively charged, and are used to bind to negatively charged tissue components, are termed basic dyes. The Colour Index uses this as a classification and naming system. These dyes are thereby specifically identified as basic dyes of the stated colour, and whose primary mechanism of staining is by ionic bonding. Note that this is a functional and colour classification. It contains no chemical information, neither does it imply that dyes with similar names but unique numbers are in any way related. It should also be noted that the classification refers to the primary mechanism of staining. Other mechanisms may also be possible. Basic dyes have amino groups, or alkylamino groups, as their auxochromes, and consequently have an overall positive charge. In other words, the coloured part of the molecule is the cation. Although the molecular charge is often shown on a specific atom in structural formulae, it is the whole molecule that is charged. An example of a dye with amino groups as the auxochrome is pararosanilin (basic red 9), and with alkylamino groups is methylene blue (basic blue 9). fastness. the application of Basic dyes is similar to that of Direct dyes n cotton but requires different and more precise controls with auxiliaries and temperature. Disperse dyes are used mainly on acetate, nylon, polyesters and acrylics. Their fastness properties vary with the dye, color and fiber on which they are used; on acrylics their fastness properties are generally inferior to Basic or Acid dyes. Disperse dyes are applied by a procedure similar to Direct dyes but with different controls depending on the fiber to which they are applied. 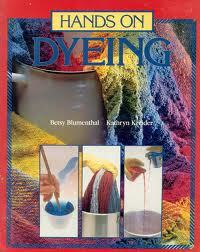 Bleaching is a process used to remove color from an undyed fiber, yarn, or fabric. The object is to produce a good white of d o r m color, while maintaining the desirable elasticity, strength, luster and other physical properties. Hydrogen peroxide or sodium hypochlorite is used on cotton while hydrogen peroxide is used almost exclusively on synthetics. The dyeing of blends, such as Damn with Cotton or Orlon with Cotton, normally will require the application of several dyestds depending on the fastness requirements of the end use application. Because of the combination of different dyes and their individual processing requirements, the procedure (almost always a two cycle dyeing) may be lengthy and complicated, adding substantially to the cost. In a reactive dye a chromophore contains a substituent that is activated and allowed to directly react to the surface of the substrate. Reactive dyes have good fastness properties owing to the bonding that occurs during dyeing. Reactive dyes are most commonly used in dyeing of cellulose like cotton or flax, but also wool is dyeable with reactive dyes. Reactive dyes first appeared commercially in 1956, after their invention in 1954 by Rattee and Stephens at the Imperial Chemical Industries Dyestuffs Division site in Blackley, Manchester, United Kingdom. The dyes contain a reactive group (often trichlorotriazine), either a haloheterocycle or an activated double bond, that, when applied to a fibre in an alkaline dye bath, forms a chemical bond with an hydroxyl group on the cellulosic fibre. Reactive dyeing is now the most important method for the coloration of cellulosic fibres. Reactive dyes can also be applied on wool and nylon; in the latter case they are applied under weakly acidic conditions. Reactive dyes have a low utilization degree compared to other types of dyestuff, since the functional group also bonds to water, creating hydrolysis. Reactive dyes are categorized by functional group. Dyestuffs with only one functional group sometimes have a low degree of fixation. To overcome this dyestuffs containing two different reactive groups (i.e. one monochlorotriazin and one vinyl sulfone) were created. Dyestuffs containing two groups are also known as bifunctional dyestuffs, though some still refers to the original combination. Other types of bifunctional dyes has been introduced. The first bifunctional dye made where more tolerant to temperature deviations (better process). Other bifunctionals are created, some with fastness (better quality) or only fixation degree (better environment/economy) in mind.